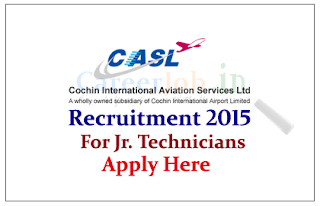 Cochin International Aviation Services Ltd (CIASL) is recruiting for the post of Junior Technicians and Junior Technicians Trainee for the year of 2015. Eligible candidate can apply online here on or before 06th June 2015. Cochin International Aviation Services Limited (CIASL) is a wholly owned subsidiary of Cochin International Airport Limited (CIAL), established in 2006 to create a world-class Maintenance Repair and Overhaul (MRO) facility in Cochin, India. The Applicant shall furnish details of Aircraft maintenance experience under the relevant columns (description of job) clearly giving the details of aircraft types, duration of employment with specific dates and nature of duties assigned. Hard copies of the applications need not be submitted, and only soft copies submitted online will be considered for evaluation.